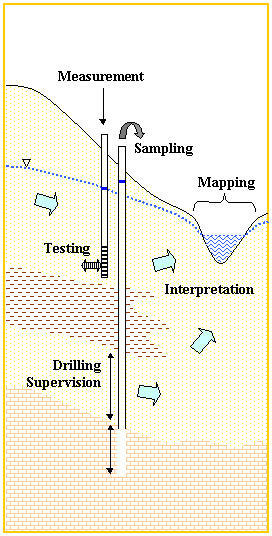 Groundwater Science Corp. is authorized by APGO (Certificate of Authorization) to provide consulting services and licensed by the MOE as a (water) Well Contractor. Key personnel are also licensed Well Technicians and Certified Technicians. This allows us to install pumping and monitoring equipment in water supply and monitoring wells, and install shallow groundwater monitoring instrumentation (such as drive-point piezometers). Groundwater Science Corp. is a member of the Ontario Groundwater Association; the Ontario Sand, Stone & Gravel Association; and, the National Groundwater Association. With over 20 years of experience our senior hydrogeologist has experience in a wide variety of projects, ranging from Subwatershed studies to site-specific assessments. As a registered Professional Geoscientist (P.Geo.) he has the experience and qualifications to provide a wide range of consulting services. With a combined 21 years of monitoring, sampling, drilling supervision, streamflow measurement and site investigation our intermediate and field staff provide experienced and consistent data acquisition. We are datalogger experts. Science Corp. is equipped to provide complete field support as needed. From water level measurement to water quality monitoring to flow measurement. If we don't already have it - we'll get it! We also make up specialty equipment - well-head assists, flow through cells, sample manifolds, bundle piezometers, specialty streambed instrumentation and our own variations to direct drive methods. Let us know what you need and we can design and construct, or modify, equipment as necessary.